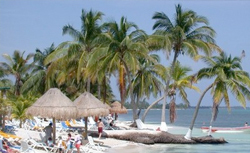 Kick back and relax on the sandy beach in Costa Maya. Whether you book an organized beach break or venture out on your own, fun and sun await. The beach was public and we paid $130 for food and drinks included and they were not that great. This was by far the best experience. This was by far the best experience. The beach was a little cluttered with seaweed but they were trying their best to clear it. Service was amazing and the bathrooms very clean! We have been to the Mayan Chan many times and will always go back when we stop in Costa Maya. We have been to the Mayan Chan many times and will always go back when we stop in Costa Maya. We book it online before the cruise. Wonderful place and fantastic food. Nice but a little busy...had booked a snorkel trip but "winds" made the snorkeling impracticable. Bus from port to La Bamba beach break. The beach area was clean and well tended. Reserved a private beachside only 15 minutes from the port. Reserved a private beachside only 15 minutes from the port. The restaurant made fresh tacos, had beer and drinks for us and provided lounges and umbrellas right on the waterfront. Was peaceful and relaxing time for our group of 20. We went on the Bacalan Fort and 7 Colors Lagoon Tour. We went on the Bacalan Fort and 7 Colors Lagoon Tour. This was a hour by bus to/from but the Lagoon was OUTSTANDING. Clear, Clean, Fresh water lagoon. Worth the trip. Carlos, the Guide was fun. The lunch was also good. First the very good . High winds, heavy sea grass, but the owners and staff still made it a great day. High winds, heavy sea grass, but the owners and staff still made it a great day. Hope to go again. While the area was experiencing "a seagrass blizzard" our day was still absolutely amazing. It was a very inexpensive taxi ride to Jaime&apos;s Blue Reef, which we booked prior to the trip. La Bamba Beach Break was great! Took a cab to the small beach area 5 miles from port. Took a cab to the small beach area 5 miles from port. Nothing special there. Relax on the beach or enjoy a cocktail from the locals (at least their drinks are affordable). Great day at the beach with amazing service. Great day at the beach with amazing service. Drinks and food were fantastic. The hosts were super attentive. I highly recommend Maya Chan Beach. Arriving early in the morning the music was electronic rave and played super loud. The walk to the transportation was longer than anticipated, however it was okay. Fun time at La Bamba beach. Fun time at La Bamba beach. Lots of drinks flowing and the attendants were very fun and friendly. Clean with plenty of space for everyone. If you pre-book a beach spot with Tropicana, there is NO charge. Super easy to get to. Our second stop was at Costa Maya. Beach was dirty, bottle and caps everywhere so wear shoes. Beach was dirty, bottle and caps everywhere so wear shoes. Food was good, somewhat bland but I guess geared for tourists.